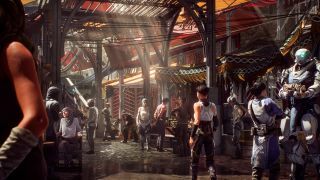 There's plenty of Anthem collectibles to be found in it's not-so-wide-world, but which ones are there specifically? You need to find a lot of them for the various missions and challenges in the game, such as the Anthem tomb challenges, so if you're looking for the various collectibles in Anthem, let us help. Here's all the different types of Anthem collectibles, from Cortex Lore and Archives to Landmarks and Overlooks. One of the first types of collectible you'll find is Cortex Lore. This is essentially information that gets added to your cortex, whether it's from a document, book, or something else entirely. You'll know you've found Cortex Lore because it will prompt you to 'Add to Cortex'. 'Other Lore' is the term we're using to describe all the other types of lore you can find in the game - so that's things like history, intel, archives and all the other bits and pieces. These are very similar to Cortex Lore, with the only difference being that it doesn't get added to your cortex. You'll be able to interact with these normally by picking them up. As you can guess, landmarks are location specific. These are the gold, glowing rings you can see on the ground. When you interact with them, the location will be added to your map. Similar to Landmarks, Overlooks are viewing spots that offer spectacular scenery. They're less obvious than Landmarks though, as there's just a small altar-like structure that you can interact with to get an incredible view of your surroundings. As soon as you've completed the See in the Dark mission, Archivist Runes will appear throughout the map. These are gold symbols that you'll find on the wall. These are all of the Anthem collectibles available, and if you're trying to accumulate lots to complete a challenge, there are some that you can farm repeatedly. As far as we can tell, anything under the Other Lore category will respawn upon death in freeplay so you can kill yourself a few times to quickly complete those objectives. Let us help you get some Anthem multi-kills.